The Fill with String command can be used to fill a selected area with a supplied text string. The selected area will be filled automatically with the string supplied. If the text supplied is less than the width of the selected text, the pattern will be repeated to fill the selected area. To prevent unexpected results, the lines affected are automatically de-tabbed prior to performing the Fill operation. If any lines in the selected range are too short, they will be extended so that a complete fill of the selected area is achieved. 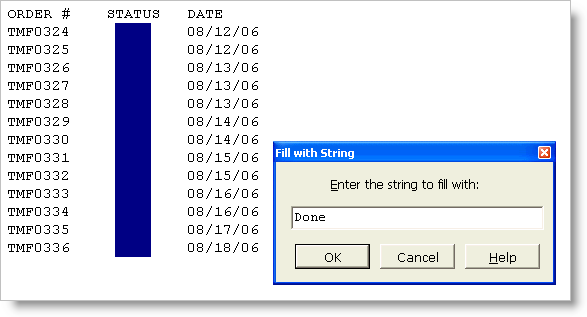 Special characters can be entered into the Fill with String edit box using the technique described in the Help topic Inserting Special Characters.